He was splitting coconuts with a machete outside his elderly aunt's cement-block house when we approached. He acknowledged me politely and gave my friend Frances a wide, welcoming grin. "This is Dam," Frances said. "He's the best trainer I've ever worked with." He invited us to sit on a woven grass mat laid out on the cemented porch. "Here," he handed us a pot. "Have some coconut water." Dam's aunt emerged from her one-room house, stepped into the sunlight and squatted next to us. "What you want for dinner? We have fish," she said, hobbling around for the ingredients. Permanently bent at the waist from a lifetime of working in rice fields, unable to stand up straight without pain, she lives her life close to the ground, fluidly moving between sitting, squatting, and half-standing. "Dam stays here sometimes," Frances told me. "He bounces around and stays with various family and friends in the area. He's homeless. Dam was living in Bangkok until I called him a few months ago. I told him I wanted him to come back to the village, be a full-time trainer at our gym Giatbundit." Dam had been working as a motorcycle taxi driver in Bangkok, holding pads for the kids at his friend's gym in the evenings. When Frances called and offered him a job back in his hometown, he packed up his Bangkok life and came home. Extended family of Dam by marriage, Frances began training with Dam at Bor. Breechaa Gym in Bangkok about 10 years ago. "Best trainer I've ever worked with," she said again. "Good talker too. 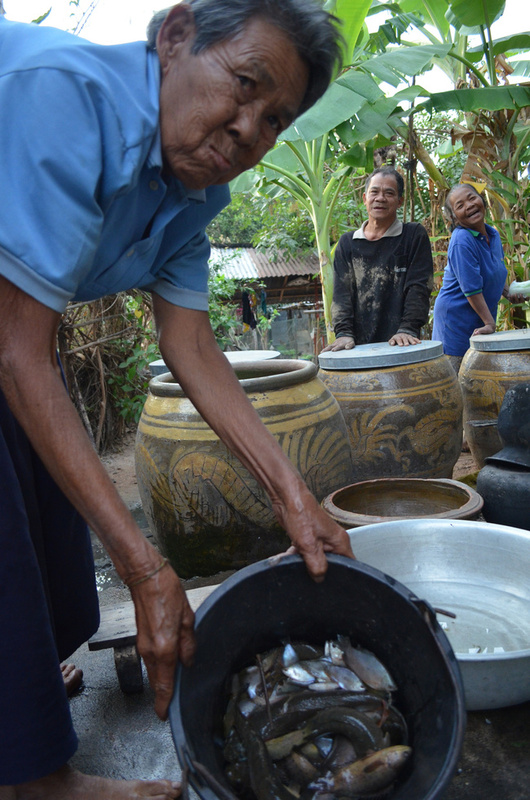 He'll ask you for a bottle of Lao Khao, and then he'll tell you some stories, whether you want to hear them or not." "What's Lao Khao?" I asked. "Thai rice whiskey, cheaper than moonshine." This was my first time meeting Dam but I thought I'd heard his name before. 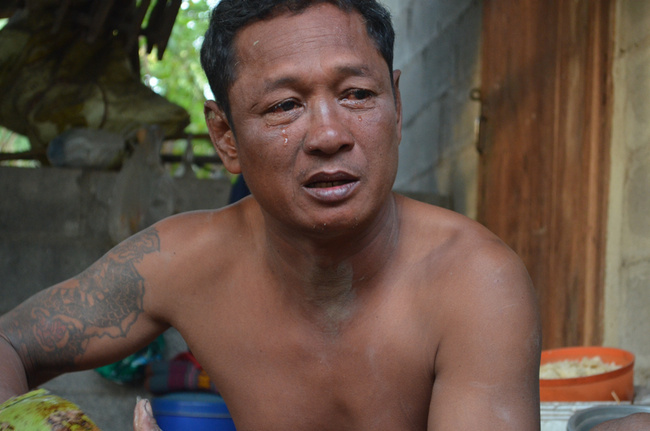 I remembered my interview with Namkabuan, a former champion and now gym owner in Buriram. He had mentioned someone named Dam, said he was the "number one pad-man" in Thailand. "Yeah," Frances said, "it's the same guy. Everyone knows he's a great trainer, and everyone knows he's also a drunk. He's famous for both." We had stopped by Dam's aunt's house for Frances to pick up clams and crabs for dinner, but I wanted to know more about Dam. He was tall, bigger than most of the other people I'd seen in the village. There was a sadness to him hidden among his initial exuberance. Here he was, the best trainer my friend Frances had ever worked with, now homeless in his own village among the rice paddies. "He's bad," Frances said. "Dam's a broken man. I've been hearing stories about him since I first arrived in this village nearly 10 years ago. 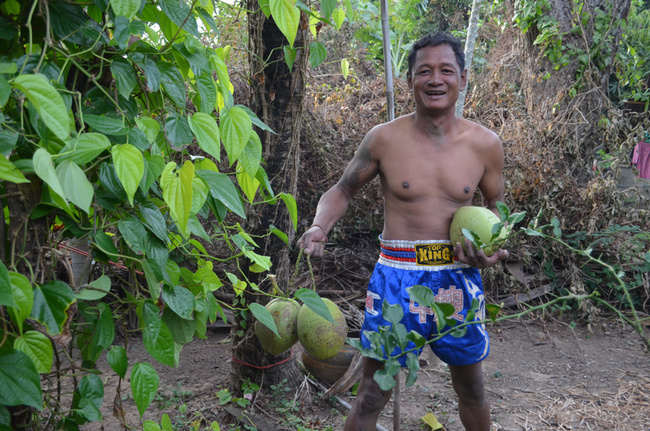 We train here in the village now because he got kicked out of Giatbundit. He punched out a fighter, broke his teeth, because the fighter said something about how he shouldn't criticize others without looking at himself first." Frances calls him a product of his surroundings. "They say he's a drunk, yet they pay him in Lao Khao." 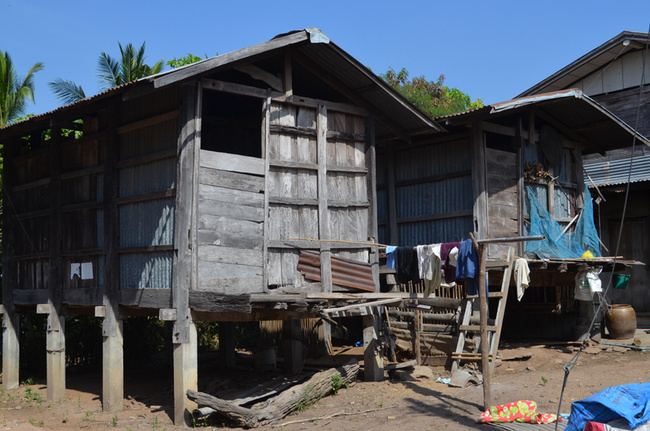 His childhood was spent fighting in Isaan, under the guidance of a local gambler who appointed himself as Dam's de facto manager. With no gym and no trainer, Dam learned by fighting, watching other boys fight, shadowboxing in his backyard and hitting a spare rice sack stuffed with whatever he could find. "It was a luxury to hit the rice bags," he said. "They broke down quickly, and they were hard to find because they were needed for farming." He told me about the slow evolution from fighter to trainer, starting in his early 20s when he moved to Bangkok and volunteered to hold pads for the other fighters when he felt the gym's trainers weren't giving them enough attention before big fights. "I just wanted to help out," he said, "and later I realized I was better suited to being a trainer than a fighter. It's a hard life, though. I was training top names who were winning big fights, but I was barely making enough to live. "That's the problem with being a trainer at a a lot of gyms: you're never paid well, never paid on time, no steady salary. Gyms naturally go through ups and downs, and it affects your wages. It's common not to get paid at all. You're given a place to stay and food to eat. You don't dare ask for more." He looked sad, almost defeated. "Okay," I said to him, "I want you to tell me a story: I want to hear about your biggest regret." 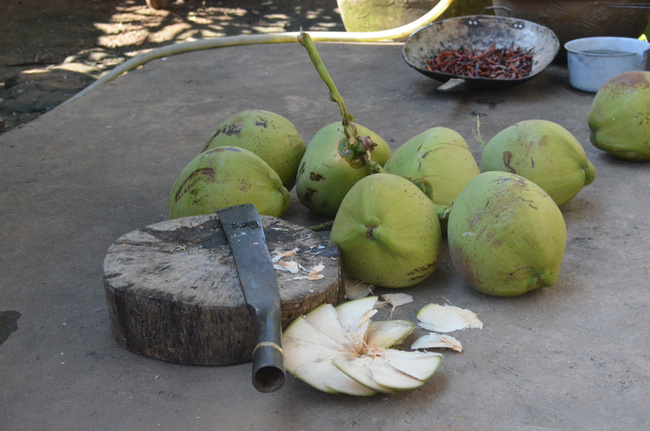 His hand loosened around the coconut and he held the machete still. "My biggest regret?" he said. He paused, took a deep breath. Tears began to well in his eyes. I looked to Frances, mouthed, "Is he okay?" She pushed him for the story. "I was 18," he said, "supposed to fight twice in one day. In the morning I fought and won on Channel 4 in Khon Kaen, then we drove to the other venue at night. "My opponent was an Isaan champion. I felt so lucky to fight him. I wanted a title shot, and I'd already beaten him once before. I knew beating him a second time would give me a shot at the title. "Everyone thought I was going to win. I remember the odds were five to two, in my favor. They called the fight a 'dream match-up' because my opponent was a famous local champion who had a lot of big-name gamblers in his corner, and I was an unknown, but the local gamblers knew I'd already beaten him and they thought I could beat him again. Even my family was there, and they put their money on me too." Dam paused. He stopped and rubbed his eyes, trying to hold back tears. His aunt pushed him and told him to start helping with dinner. Dam ignored her, too engrossed in his story. "I don't want to remember," he said. "I was gearing up to face the champion. And then… they told me I had to throw the fight. "The owner of my gym said they needed money. 'The other boys at the gym don't have enough to eat,' he said. 'You have to throw this fight so we can feed the kids.' The odds were in my favor, so whoever bet against me would have made a lot of money if I didn't win. My own gym bet against me secretly, then told me to lose. "I was only 18, barely more than a kid myself. I had everything going for me back then. But I had to do it. I had to throw the fight. When the owner of the gym asks you to do something, you do it. You have to. He owns the gym, he owns your contract, he owns you. 'The kids need food, the kids need food,' he kept saying. And it was true, the gym was poor, the other boxers did need food. I wanted to help. "So I did what they said I had to do. "I wasn't even paid for the fight. The boss said he needed my purse for the gym. There was nothing I could say or do about any of it." Dam stopped talking abruptly to wipe tears from his eyes. I looked at Frances uncomfortably. No one had ever cried during an oral history interview before. She was unfazed. "Alcoholics living in the past," she said, "and now they're stuck with no way to make money and move on from life after Muay Thai." Dam tried to compose himself before continuing. "You want to know what the worst part of fighting is? It's not the pain or the cuts on your face or the training or anything like that. The worst part of fighting is the humiliation when you lose, when everyone knows you should have won, when you know you should have won. Having to walk out of the ring with everyone jeering and booing at you, calling you worthless. Stupid. Weak. "They all yelled and screamed at me, threw their beer cans at me after that fight. I just had to keep quiet and take it. I couldn't defend myself, couldn't tell them that it wasn't my fault, that I didn't want it to be this way. My family was there watching me and I couldn't even look them in the eye as I left the ring. All the money my friends and family lost on me that night… I can never pay it back. "But that's how you have to throw a fight -- you have to make sure no one can tell and that everyone thinks it's real. I kept it a secret for years, from everyone I loved. I was so ashamed. "It happened 30 years ago, but I still think about it often. It messed me up in the head. In the heart, too. "Look at me now, I have nothing to show for any of it. I was a good fighter, and I trained top fighters, helped others become champions, and I never got my own shot for anything bigger. I'd be a different man now if I hadn't thrown that fight. "Being a trainer is hard, being a fighter is hard. People use you and then cast you aside. It's a harsh world. Now I have a young son, not even a year old. I don't want him to go through what I had to endure. I won't ever let him be a Muay Thai fighter." Frances was the first to break the silence on our drive out of the village. "You know his son?" she said. "He's just a baby, but he's going to be a fighter, no matter what Dam wants. He was born into that life. Dam couldn't escape, and his son won't escape either." Thai-English interpretation by Frances Watthanaya.